Send this delicious combo with12 red roses and 1Kg cake with choice of your flavor to your dearest ones.Looking for something special? 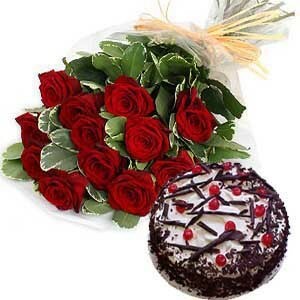 How about our Red Roses with Cake gift hamper? This lovely gift hamper suits all occasions such as birthdays, anniversary, wedding day, Valentine’s Day, retirement, graduation or baby shower. Send roses bouquet online and enchant your loved one. 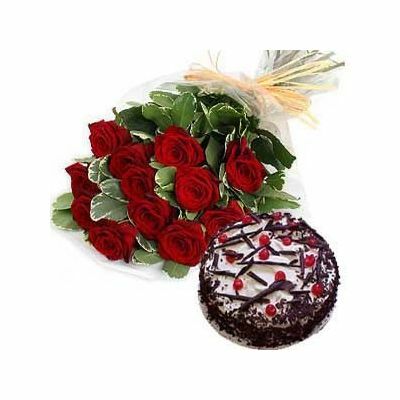 Our florist has expertly combined the 12 long stem roses in a pretty bunch and you can also choose the flavor of the delicious one kg cake that comes with this attractive bouquet. The flavors available are (Butterscotch, Vanilla, Strawberry, Pineapple, Black Forest and Chocolate). Send flowers and brighten up someone’s day, tell them how special they are and show them how much you care.